Bank compliant check printing with world's smallest All-in-One! 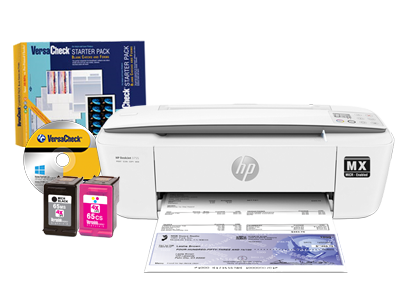 Features Wi-Fi, Print, Scan, Copy, and super small footprint! Weighing only 5lbs, this ultra-compact all-in-one check printer is designed to fit where you need it. 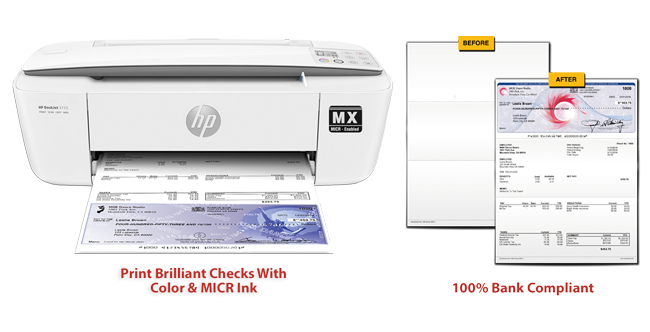 The HP 3755MX lets you print full color checks and documents with bank compliant Magnetic Ink Character Recognition (MICR) ink. Easy-to-use, this printer saves you 50-80% or more vs. buying pre-printed checks from banks and mail-order suppliers and is equally able to handle all your everyday document printing, copying, and scanning. Check printing with the 3755MX is 100% bank compliant with MICR enabled VersaInk™ cartridges. You can print directly from your desktop or any network connected PC via built-in Wi-Fi networking connectivity.